Coach Jason Quinter (C) presents an oversized cheque in the amount of $1696 to Don Armstrong (L), Coordinator, Salvation Army Food Bank flanked by a Huskers player. he Valley Huskers are pleased to announce that the winner of the “Groceries for a Year” draw held May 23 was Agassiz resident Colleen Pilsner (Lottery License 82435, ticket number 0456). Huskers President Jack Covey extended the club's appreciation to Chances Casino and Save On Foods on Yale Road for sponsoring the event at the drawing on Monday. Covey also thanked local businesses who allowed volunteers to sell tickets at their locations and events, and also to the media for promoting this fundraiser. 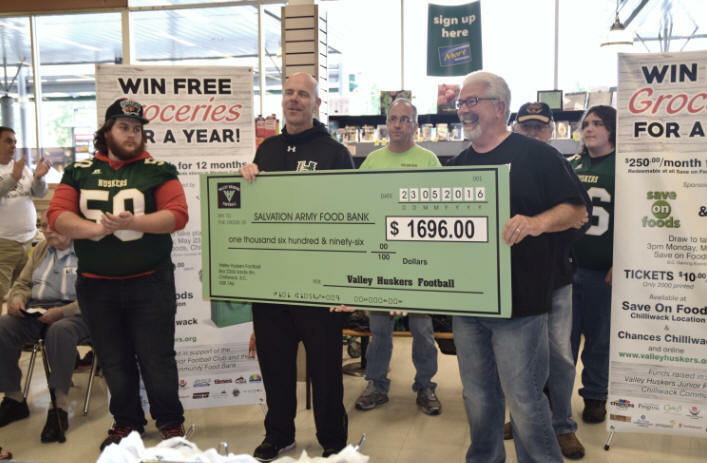 New Head Coach Jason Quinter was front and centre both presenting a cheque in the amount of $1696 to Don Armstrong, coordinator of the Salvation Army Food Bank, as well as drawing the lucky ticket at Save On Foods on Monday. Event organiser Lisle Pritchard made the phone call to Pilsner. "The organising committee would like tell everyone to 'stay tuned', another draw is in the works and will be launched in the near future," said Hudson on Wednesday. "If you’d like to join in the excitement and be part of the team, visit www.valleyhuskers.org or via email here. We are always in need of valuable volunteers."